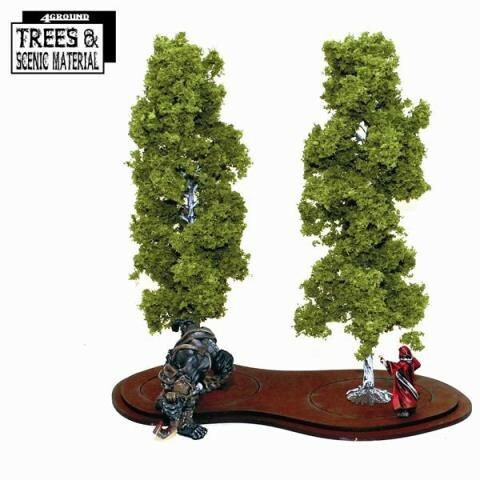 TMS-110 these Mature Birch Trees are part of our Trees & Scenic Material range, it is suitable for 28mm, and 15mm games. Birch is a broadleaved deciduous hardwood tree of the genus Betula in the family Betulaceae, which also includes alders, hazels, and hornbeams, and is closely related to the beech/oak family, Fagaceae. The genus Betula contains 30 to 60 known taxa. They are typically rather short-lived pioneer species widespread in the Northern Hemisphere, particularly in northern temperate and boreal climates. Birch species are generally small to medium-sized trees or shrubs, mostly of temperate climates. The simple leaves are alternate, singly or doubly serrate, feather-veined, petiolate and stipulate. They often appear in pairs, but these pairs are really borne on spur-like, two-leaved, lateral branchlets. The fruit is a small samara, although the wings may be obscure in some species. They differ from the alders (Alnus, other genus in the family) in that the female catkins are not woody and disintegrate at maturity, falling apart to release the seeds, unlike the woody, cone-like female alder catkins. The bark of all birches is characteristically marked with long, horizontal lenticels, and often separates into thin, papery plates, especially upon the paper birch. It is resistant to decay, due to the resinous oil it contains. Its decided colour gives the common names gray, white, black, silver and yellow birch to different species. The buds form early and are full grown by midsummer, all are lateral, no terminal bud is formed; the branch is prolonged by the upper lateral bud. The wood of all the species is close-grained with satiny texture, and capable of taking a fine polish; its fuel value is fair.